The bottom line: You can trigger a large and dangerous slab avalanche on leeward slopes where strong winds have been transporting fresh snow near and above treeline. Conservative decision-making will be essential, particularly above the rain/snow line from Tuesday night. Where rain has occurred, you may trigger small loose avalanches on slopes greater than 35 degrees. Timing will be a major factor on Tuesday. The storm is currently forecast to impact the Mt. Hood area much more significantly Monday night, but if it comes in early, expect higher hazard than forecast. The avalanche danger is likely to peak overnight or early in the morning and will decrease with gradual cooling and as rain and snow showers decrease. A warm system will bring rain up into the near treeline band. The Loose Wet avalanche concern will peak overnight or early in the day as rain and warmer temperatures continue to add liquid to the snowpack. These can ruin your day particularly if they push you into a trap or obstacle or over a cliff. Moderate to heavy snow combined with rising freezing levels and strong to extreme winds Tuesday night will create large wind slabs which you are likely to trigger anywhere above the rain-snow line. Moderate winds will continue transporting snow above the anticipated 6500 ft snow line on Wednesday morning. This avalanche problem will extend below treeline if the snow level is lower than anticipated. You might find hard, punchy and supportable (hard) slabs or slabs that you can trigger in softer snow. Due to the strength of the winds, these slabs are likely to be larger and extend further away from ridge crests than usual. Steer well clear of wind-loaded slopes steeper than 35 degrees. When unsure whether a slope was wind-loaded, use ridges or low-angle slope to travel through the terrain. 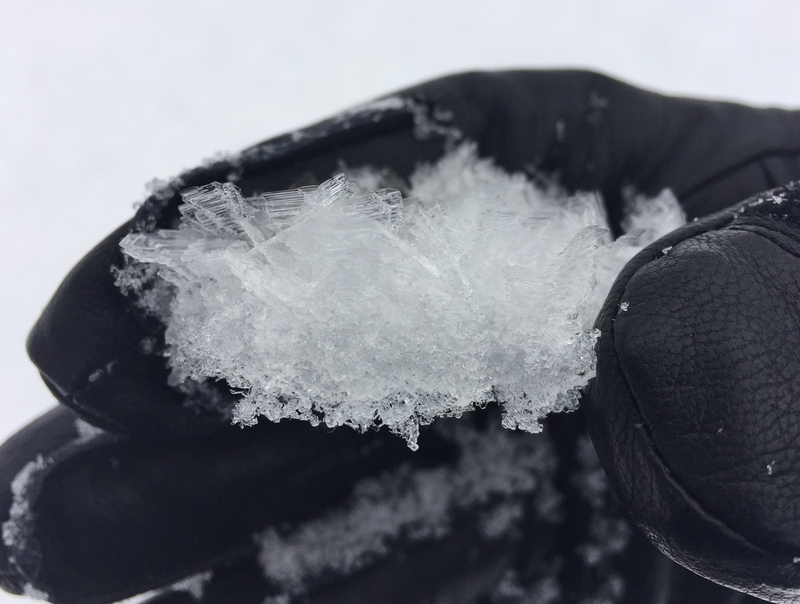 In very wind-protected areas, the upside down snow may present as a storm slab. You can use very small steep rolls to test the snow for this problem.